TNPSC Junior Assistant Recruitment 2019: The Tamil Nadu Public Service Commission will be released a vacancy for the candidates in large number. The announcement of the TNPSC Junior Assistant Recruitment 2019 will be made by the recruitment notification released by the department. There will various vacant posts in the department under different work profile. The application submission is accepted online only whose the last date very soon updates. Candidates are alerted to read the detailed TNPSC Group 4 Recruitment Notification, application dates, eligibility criteria, and selection process through the complete article. Latest Update: TNPSC is going to release the Junior Assistant 2019 Recruitment notification for various vacancies. Interested & eligible aspirants can fill the application form before the last date from here. The announcement of the TNPSC Junior Assistant Vacancy will be made by the recruitment notification released by the TNPSC department. 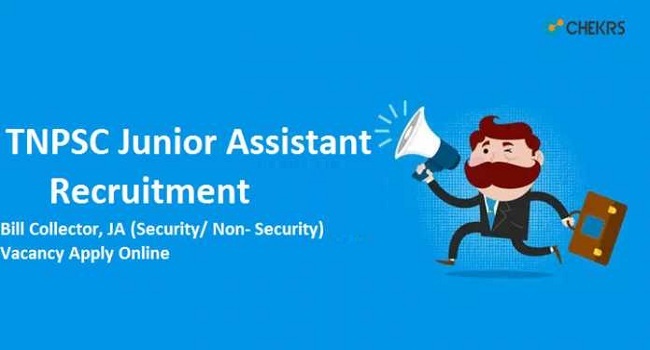 (टीएनपीएससी जूनियर सहायक भर्ती): The TNPSC will be inviting candidates to apply for security, bill collector and non-security work profiles under TNPSC Group 4 Junior Assistant Vacancy 2019. This is the opportunity provided to get the state Government Job to the willing candidates. All those candidates who possess minimum educational qualification are advised to timely TNPSC Bill Collector Apply Online. The application process can be checked for details given below in the article. The vacancy of the described posts is different for various posts. As the submission of the application is online the candidates will have to be very careful in the submission of their applications. However, the submission will be made easy by us by providing steps to fill the application form. Also, a direct link to Tamilnadu JA Online Application Form 2019 submission is given here. Kindly refer to the table for getting important dates. The candidate should have passed S.S.L.C Public Examination or its equivalent with eligibility for admission to Higher Secondary Courses of Studies or to College Courses of studies. Applicants should possess knowledge of Tamil language. The minimum age should be 18 years and maximum age limit for the applicants is 35 years. The candidates will have to pay Rs 100/- as examination conduction fee. Click on the tab for recruitment. Click on the link to Apply online next to notification of Group 4. Register on the website using the right credentials. The application will appear on the website. Fill the fields with correct information as per requirement. Click on the link to submit. Application fee submission will be redirected. Submit the fee using the online payment method. The application will be submitted successfully. Meanwhile, the candidates can begin their preparation. To know about the exam details such as for admitting card, syllabus and dates bookmark the page jobs.chekrs.com. You can solve your queries by commenting on the section below.